The global auto industry is collaborating as never before. This week, GM and Ford announced that they are once again teaming up to develop transmissions. Toyota and BMW are building fuel cells together. Ford and Toyota are working on hybrid systems for large vehicles including pickup trucks. Collaboration on special projects seems to be more successful than outright alliances, e.g., Daimler and Chrysler or Volkswagen and Suzuki. Some alliances such as Nissan and Renault do work, but much evidence points to difficulties that seem nearly impossible to surmount. DaimlerChrysler unraveled because of strong cultural differences. The same can probably be said about Volkswagen and Suzuki. Given that collaboration is one of the auto industry’s buzzwords, we thought that wed pose a few questions to some of the people involved in decision-making, individuals that may have a stake in cooperating with other companies including those across industry lines. Is collaboration the way for industry stakeholders to go? Fred Thomas, Industry Director of Apriso answered, In many instances, yes. The immense cost of bringing new products to market at the pace demanded in todays globally competitive automotive industry, is driving a whole new look at collaboration opportunities from product development through manufacturing. This holds true for both components and vehicles. 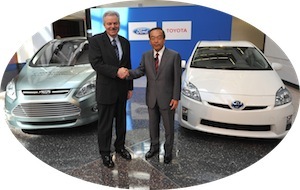 Added Thomas, But, collaboration in the global automotive industry is not new. It has been going on for years. I think what youre seeing today is a renewed focus on finding ways to work together for a common good, while remaining fierce competitors on the global automotive playing field. That common good may include jointly developing hybrid drive systems, a joint effort that can reduce fuel consumption and lower vehicle emissions. Of course, working directly with other businesses to co-develop a product, a key component or other supplies is not without risk. Exclusive intellectual property rights may be compromised and then there is a matter of personal liability. That led to our second question is there a potential downside such as shared personal liability for co-developing a product that might fail? Sarah Lee Marks (MyCarLady.com), an independent auto buyers agent and car consumer advocate who also works with dealers and manufacturers on training, brand marketing and digital positioning offered the following response: Today so many components are supplied by one supplier to many brands, when it fails it fails for everyone, so all the products are tainted by a recall campaign. A joint venture at the manufacturer level might actually insure a better product down the line. Beyond the high-profile news-making collaborations of late, we also wondered are there other areas where companies might cooperate? Torsten Maschke, President, Automotive Sales and Marketing, Freudenberg Sealing Technologies, offered his input. Said Maschke, While collaboration has become, in my mind, a business imperative, it also remains a complex, complicated means of leveraging research, talent, systems and solutions. Suppliers are protective of their independence but need to very clearly understand and communicate their position in the market. When they collaborate with their customers, there is a mutual expectation that their intellectual property will be protected and secure in the relationship. When a customer is concerned that collaboration might lead to a loss of competitive advantage, even if this concern is unfounded, the relationship is likely to go awry. For example, when Magna tried to become an OEM by taking over Opel, other OEMs were extremely concerned about their IP falling into the hands of a potential competitor and they abandoned projects with Magna. He added, There are, of course, examples where this kind of thing has worked. SGL Carbon in Europe is an example. The company is jointly owned by BMW and Volkswagen and supplies both companies with critical technology solutions. In general, however, these kinds of collaborative arrangements work best when the technology the supplier brings to the table is unique and arrives early in the life cycle development process. In the case of mature products, just the opposite can occur OEMs can sever their relationship with their own in-house supplier development organizations (GM-Delphi, Ford-Visteon) because they cannot leverage enough capability, cost savings and profits from these relationships. Collaboration may not always be possible especially in an industry that is also consolidating. PRISM Plastics has grown its business from $9 million in sales in 2009 to more than $25 million in booked business this year and has done so as other suppliers have consolidated. This injection molding company is a Tier 2 supplier that works with Takata, Autoliv, Key Safety, by providing difficult to mold parts that keep its customers coming back for more. PRISMs co-owner and vice-president, Gerry Phillips, is confident that even if an OEM switches Tier 1 suppliers that it will pick up enough business elsewhere to maintain its position. Instead of collaboration and consolidation being driving factors, maintaining a competitive edge may help niche manufacturers such as PRISM not just survive, but thrive.